Also while down at Drie's parent's home, we took a trip out to a local park to feed the birds. 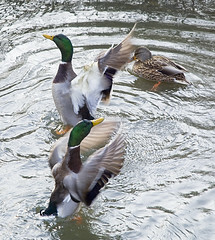 As we walked around Firestone Metro Park these Mallard Ducks were showing off (I think they were looking for hand-outs). For more images from Firestone Metro Park, check my Flikr account.